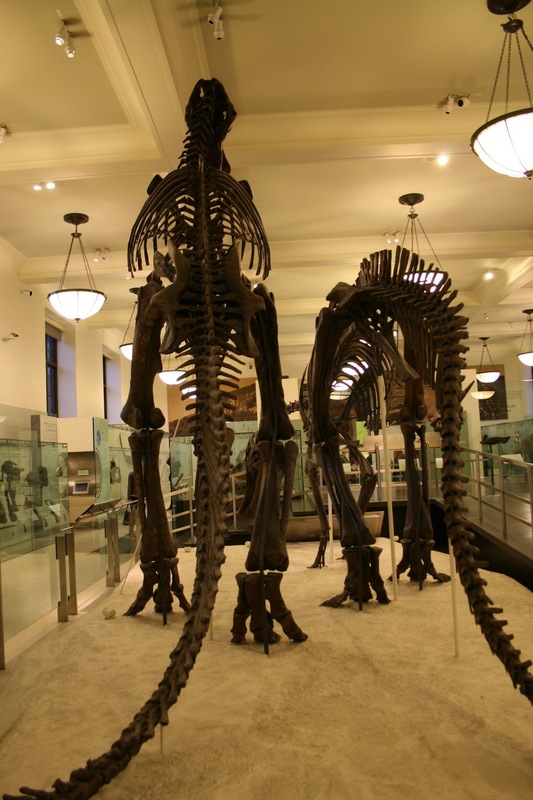 In my continued quest to betray my dinosaurian research roots, I went to the American Museum of Natural History in New York to look at turtles! And what turtles they were – this is the skull of Ninjemys (the ninja turtle! 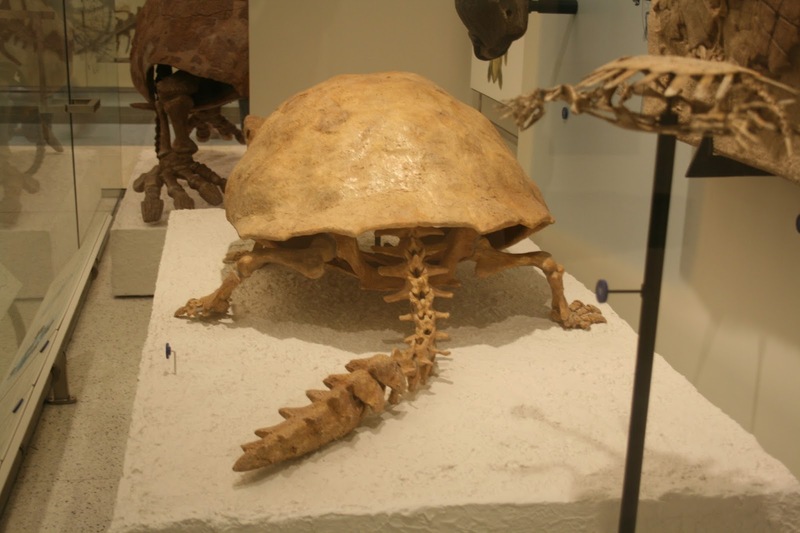 ), a giant meiolaniid turtle from Australia. Meiolaniids are the best turtles you’ve never heard of and it’s a crying shame that they don’t feature more prominently in prehistoric popular media. 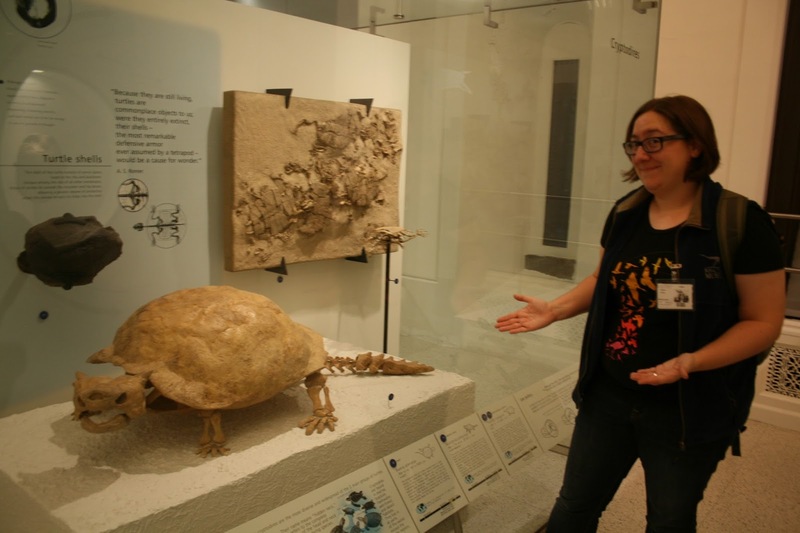 Meiolaniids are basically ankylosaur-convergent turtles, all of which are very large for turtles and some, like Ninjemys, which would have been legitimately huge. They are only found in the southern hemisphere (and really mostly in Australia and nearby), and they all have elaborate cranial ornamentation. 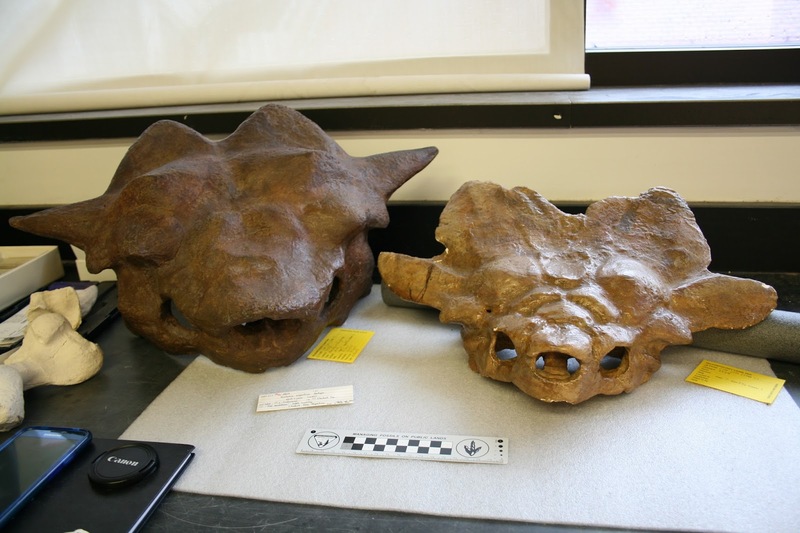 On the left in this picture is that same Ninjemys skull cast, and on the right we have Niolamia from Argentina – smaller, but arguably even weirder with those huge nuchal crests flaring off the back of the skull. I’m interested in meiolaniids at the moment because they are one of the other groups of tetrapods that evolved a club-like tail weapon. Here’s Meiolania platyceps, an island dwarf (!) meiolaniid, with some kind of boring mammal for scale. And here’s the business end of Meiolania. Stay tuned for more exciting discussion of animal business ends in the future! 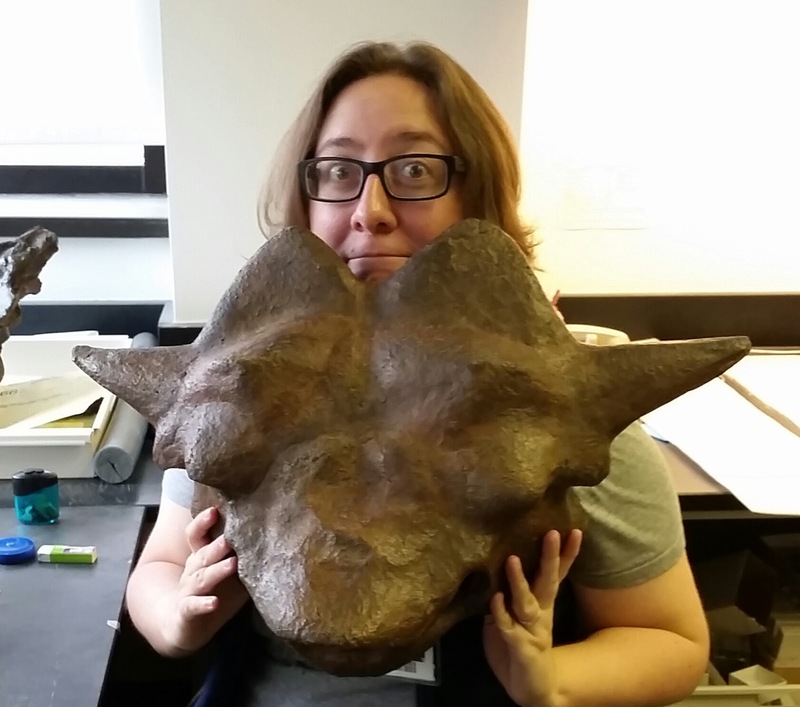 …and a Triceratops derriere, for good measure. 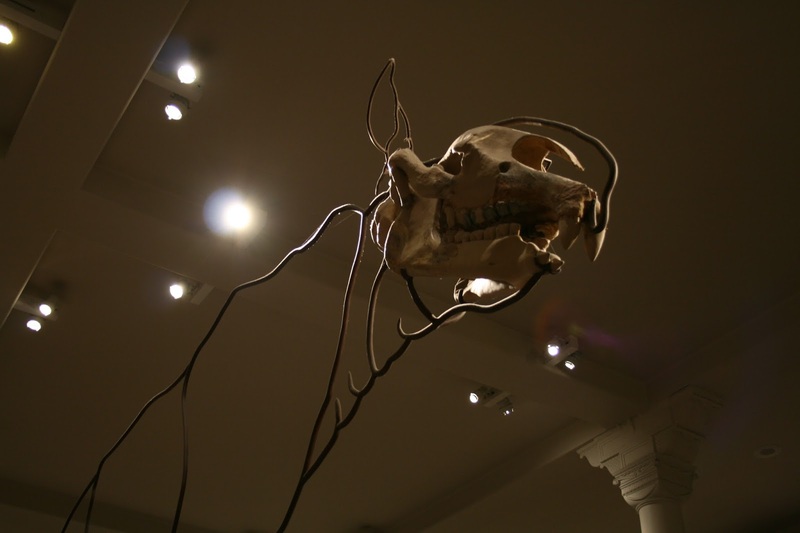 Elsewhere in the fossil halls, I enjoyed meeting the disembodied floating head of this indricothere, which makes for a nice counterpoint to the fleshed-out model currently on exhibit at the North Carolina Museum of Natural Science’s feature exhibit Extreme Mammals. And here’s a lovely trio of cingulates! 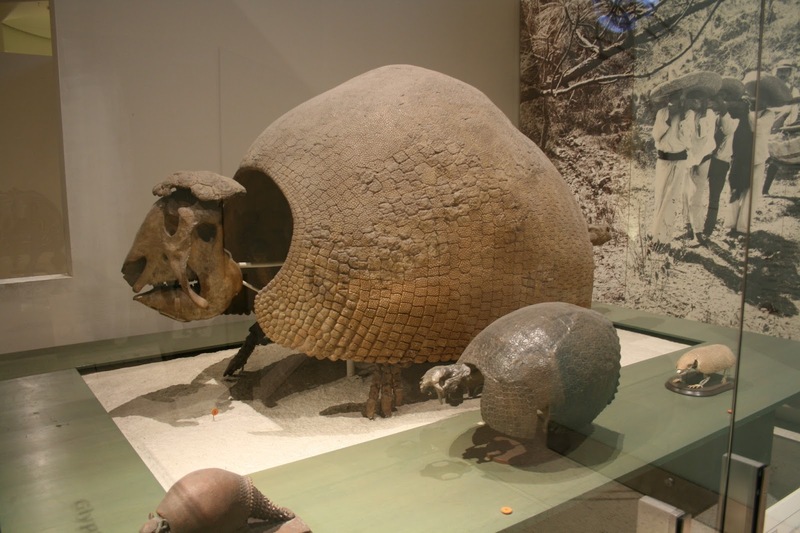 The big fellow is the derived glyptodont Panochthus, the medium-sized fellow is the early glyptodont Propalaeohoplophorus, and off towards the back the little guy is the extant six-banded armadillo, Euphractus sexcinctus. The tail club on the Panochthus is mounted really weirdly, with it sticking straight out from the back of the shell rather than having any of the mobile rings from the base of the tail present, so I’m not sure what’s quite up with that. 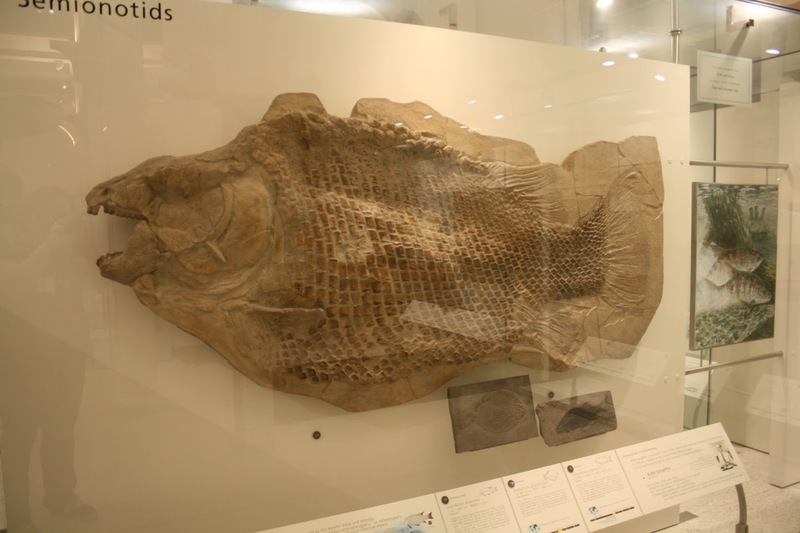 I post woefully few fish fossils on this blog, so here’s a pretty great semionotid! Science and anatomy and zoology are all around us if you keep your eyes open! 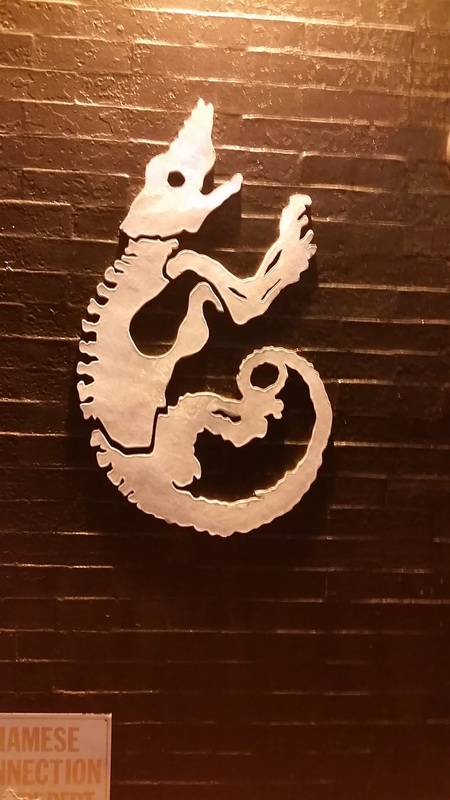 I loved this chameleon logo on the side of a restaurant we came across one evening. So bummed out schedules didn't match up that week! I know! If you should find yourself in Raleigh in the next six months or so, let me know! Too bad human hunters wiped out the meiolaniids and glyptodonts. They could've shed a lot of light on ankylosaur behavior. @starman: The meiolaniids on Lord Howe Island were not wiped out by man – there is no evidence for the presence of man on LHI until the late eighteenth century, long after Meiolania platyceps went extinct. @Stephan Poropat: I was aware of Lord Howe Island; somebody mentioned this in the natural history subforum in Historum, and asked why meiolaniids disappeared there. I wonder if native seafarers could've stopped there temporarily in search of provisions and cleaned out the turtle population. Given the small size of LHI it wouldn't have been difficult. The island couldn't have harbored many. The short answer is the cause of their demise is unknown. In fact, the age of the youngest meiolaniids on LHI is also unknown. The island was evidently unknown to Pacific islanders/Polynesians (bear in mind they didn't get to New Zealand until 750 years ago), and if they had stopped there at any stage it is likely that they would have left some evidence of their presence (introduced plants and/or animals, artefacts, etc.). I'd love a digital copy if you can find one! Also, the magazine looks beautiful! Polynesians would have needed big vessels to ship all the turtles out in one fell swoop. Failing that, they would have needed to have made multiple visits. Either scenario (i.e. one or a few visits by a large vessel, or multiple visits by small vessels) increases the chances that at least one foreign species would have been introduced. 9) innumerable other possibilities not involving Homo sapiens. I am not saying that I think that it is impossible that people knew about LHI before Ball; it is entirely possible. At present, however, there is no evidence for this at all; consequently, interaction of any description between humans and Meiolania platyceps should not be seriously entertained. For the record, in her latest paper on meiolaniids, Juliana Sterli states that she is not convinced that “Meiolania damelipi” from Vanuatu is a meiolaniid, suggesting that it is more likely to be a testudinid. This is the _only_ putative meiolaniid taxon for which evidence of human interaction has been identified; its removal from the Meiolaniidae eliminates evidence of human-meiolaniid interaction entirely. Sterli, J. 2015. A review of the fossil record of Gondwanan turtles of the clade Meiolaniformes. 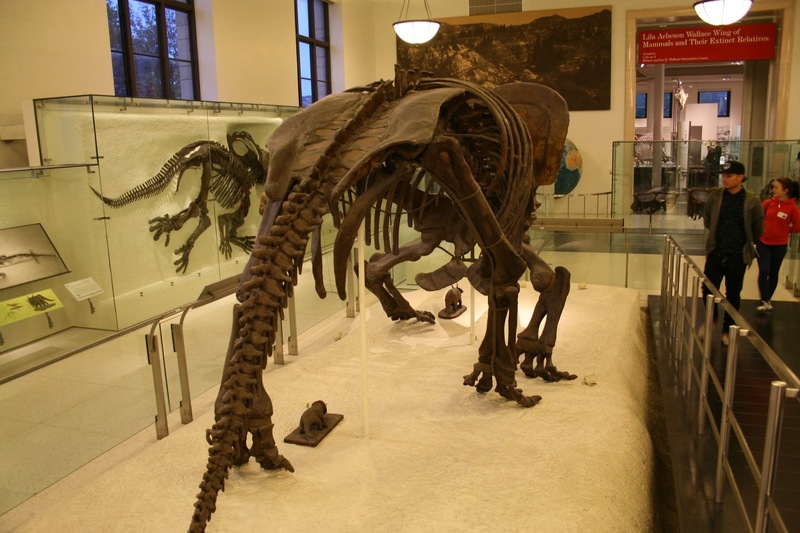 Bulletin of the Peabody Museum of Natural History, 56, 21–45.